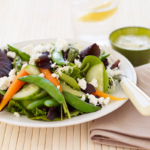 Fresh and healthy seasonal vegetables topped with goat cheese. The perfect way to get back into salads this Spring. Topped with the Lemon Vinaigrette Dressing, it’s the perfect salad to serve alongside any grilled lean protein. Combine all ingredients in a screw top jar and shake well until combined. Set aside. Quickly blanch baby carrots, asparagus and peas in boiling water. They’ll only need a couple of minutes. When ready strain and rinse under cold water to stop the cooking process. In a salad bowel combine mixed lettuce leaves, cucumber and cooked vegetables. Just before serving dress with the vinaigrette and top with goat cheese.